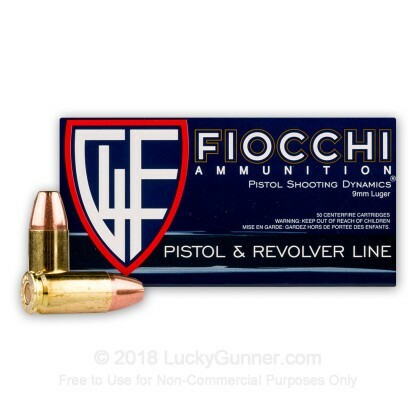 Great reliable ammo from a reliable retailer. I live in upstate NY and Surrounded by Cuomo Cronies who won’t abolish the “unsafe” act. Lucky Gunner makes it easier to keep my guns loaded and my family safe. Semper Fi. 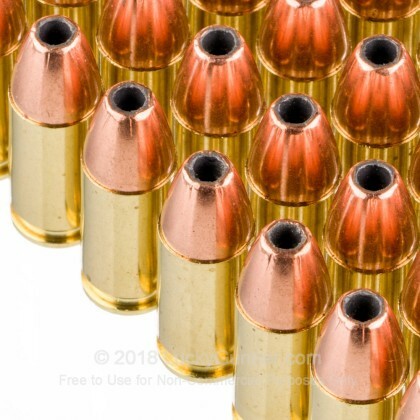 I'm reordering another 1000 after nearing depletion of my first 1000 with this ammo - and it's the perfect blend of accuracy, power, reliability, and training with what you carry. I use it for range, IDPA/NRA Action Pistol, GSSF, and my EDC. Zero problems. Lucky Gunner does it again!!! Super fast and reliable shipping. Great packaging and arrived in two days from date of order. 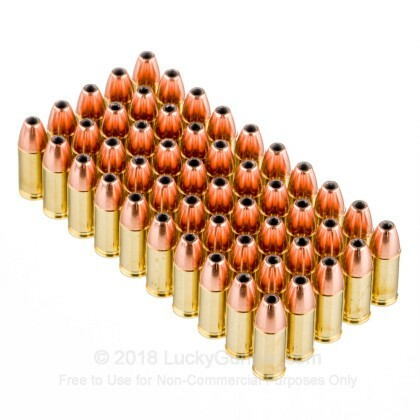 Reasonably priced 9mm hp ammo. Shoots good and straight, no jams or issues with my glocks and sub2000. This is my 4th order from them, trust in these people for all your ammo and gun supply needs. You wont be disappointed!! 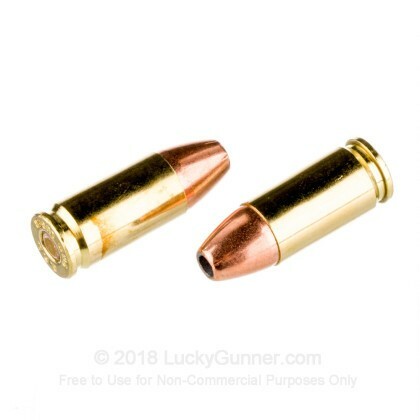 I believe you should practice with what you carry, and this ammo is excellent for both. 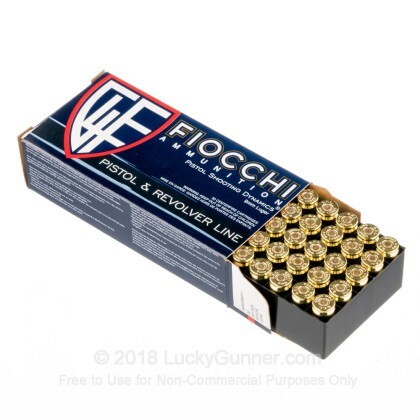 It's inexpensive and modestly loaded so it's great for practice (many smaller carry guns are only rated at intermittent +P and +P+ use...so again why would you carry ammo you can't actually use?) and it's dead reliable with a great bullet design. I don't feel like I've made any compromises between cost and quality. Very happy! Good price. Came quickly. Shoots flawlessly in 2 Auto-loaders. P11 and XDS. Took several weeks to get time to run >200 rounds on two separate sessions thru FNP-9 and RAP 401 to form reliable basis for eval. One FTE on the FNP, which may not even have been related to the ammunition (spent casings raining down from adjacent stand). Good price, eminently consistent placement, eminently reliable. This ammo shoots very well in my XDM 9MM, I've trusted this brand for many years now. Thanks to LuckyGunner for unheard of prices and fast delivery! Great delivery, fast and instock. Ammo works with no problem (in my sometimes finicky autoloader). 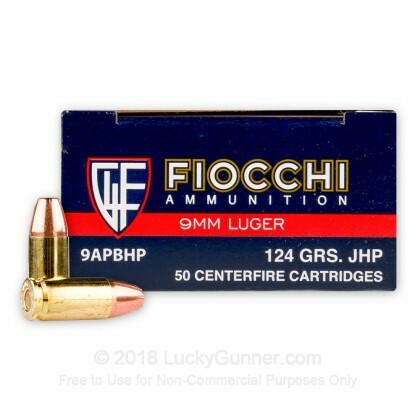 We also have this 9mm - 124 Grain JHP - Fiocchi - 50 Rounds ammo in stock in a smaller quantity.